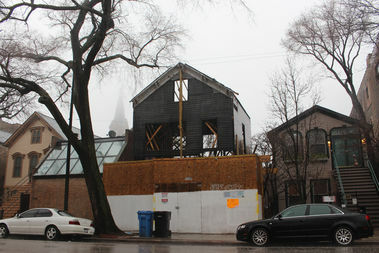 Owner Joseph Younes insists he's trying to fully restore the building at 1720 N. Sedgwick St. DOWNTOWN — The owner of a "rotted" Old Town Triangle building agreed at a court hearing Thursday to shore up the structure, as he was again threatened with fines for violating landmark regulations. Owner Joseph Younes agreed to pay $8,500 to shore up the front facade and cornices of a building he himself has called "rotted" at 1720 N. Sedgwick St. in the Old Town Triangle Historic District. The agreement came as part of a court hearing in the Daley Center before Associate Cook County Court Judge Patrice Ball-Reed after talks between engineers for Younes, the city and CR Realty, which has been appointed by the court as a temporary receiver on the property. City attorney Greg Janes called it "a battle of structural engineers." Younes' attorney Hugh Howard took issue with that depiction, saying, "We're just going to call it a difference of opinion." In any case, they quickly reached agreement on the need to shore up the existing structure, and also to further test the soundness of the foundation. The city and Ald. Michele Smith (43rd) have charged that Younes deliberately left the building to decay in order to force demolition. That would violate preservation provisions of the Old Town Triangle Historic District. Younes has disputed that, insisting that he wants to put it back in shape as is. "My team is taking every step necessary to ensure that all of the city's concerns are addressed so that we can complete the project and return the structure to its former glory," Younes said after Thursday's hearing. But Cynthia Roubik, staff architect with the Commission on Chicago Landmarks, emphasized that repairs were still subject to necessary building permits, and that Younes remained subject to hefty fines discussed by the commission at its meeting earlier this month. "The point of today is not to revisit the past. The point of today is to move forward," Howard said in talks with Roubik outside the courtroom. "We'll talk about the fines." Janes said they'd be holding "a meeting of the minds on how to proceed on the rest of the building" ahead of the next court date, set for May 18.